The Aprilia RST1000 Futura comes equipped with a shroud inside the fuel filler cap that some owners have removed. Removing it makes it easier to completely fill the bike up at fuel stops, as you can actually see inside the tank. It’s also quite easy to do if you’re careful. Of course, the shroud was put there for a reason – probably to stop overfilling. After being squirted in the eyes when not being careful enough when filling the bike up it’s a tempting idea, but I haven’t done it – yet. 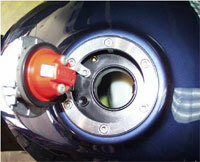 For a step by step guide on how to do it click the following link: Aprilia Futura filler cap mod. This document was rescued from RST1000.org, the first Futura website. Sometimes you can open the filler cap to find water in there. See the water in the filler cap page for what to do.